I met up with some friends last night. Friends I made at my last job. I see them now every 6 weeks/2 months or so. Abs we do Fantasy Football together. “Jack,” my friend then boss then friend again, was at the bar, I pushed his back a bit. He turned around, saw it was me and by instinct, opened his arms up for a hug. Ok not really a “hug” hug, not a full embrace, but the common pull towards each other, wrap the right hand around the man and give the standard three “bro pats” on his back, as he simultaneously does the same. This is common amongst friends. “Ay, Petey. How you doin?” Hug, kiss. 20 years later, that group of friends still does that. Love those guys. Where was I? Oh yeah, last night. I hadn’t really noticed before but last night I realized that I’m at the Bro Pat stage with these guys I know through work. We’re at that stage. 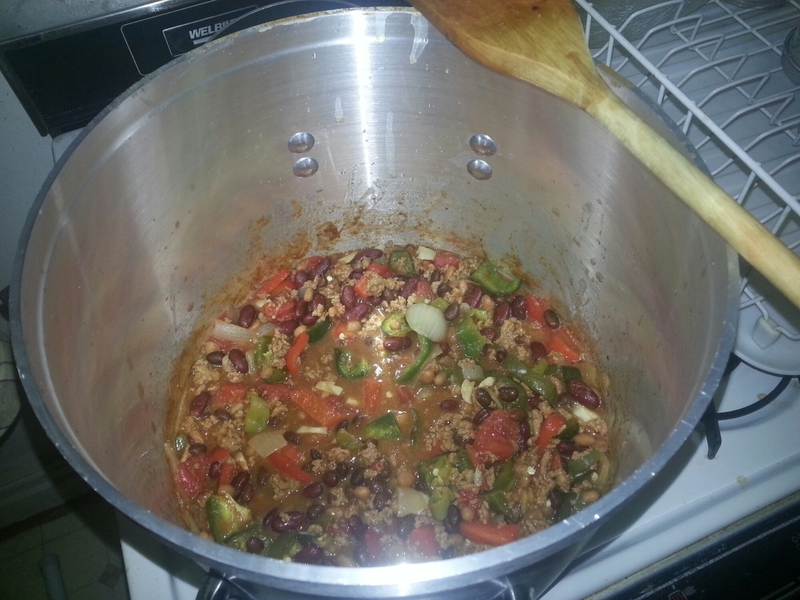 Jack, however, still makes a better chili than mine, the prick. Every good man should know how to make chili. I once had to teach a man how to properly hug a woman. No bro patting. Bro hugs are cool. Fulls hugs for the wayback friends, too. All good, Rex. Oh gosh. That chilli looks sooooooo good. Nice! I’ve never been. Where in Australia? There’s so many places I’ve yet to see! I love road tripping over there. I would love to settle in Austin. Oh yes, I have. It’s such a great country to be driving in 🙂 You guys are lucky in that. It takes forever to get anywhere in Australia! My first trip started and ended in Vegas but I traversed through Texas to New Orleans and back to Vegas. Second trip was more an East coast crawl ending in New Orleans and flying to Vegas before home again. This year is still in the air but we may be sticking to West coast and Burning Man. Austin is great, it felt like home to me. Plus there’s squirrels! SQUIRRELS!!!! You’re excited about Squirrels? We have squirrels in NY too. We have no squirrels here. So when I came across some in the gardens at congress I may have behaved like a crazy Aussie and chased them around. I’ve done that exact route. New Orleans, Texas, Vegas. did you stop at the grand Canyon? Smart. We were rushed because we wanted to get to Vegas. Didn’t have time to hike. Just around the rim. It wasn’t a finished product, but it was good.